If you want to apply some dirty edge to the sound of your bass, or down- tuned six-string, make the FuzzMo your first port of call. Character and shape controls offer a wide choice of tonal options. Lots of distortion available. EBS is a forerunner in bass equipment, noted for robust build and high levels of performance. The FuzzMo pedal certainly lives up to that reputation, and it's capable of delivering high gain and outrageous distortion. "There are times when you just need to dirty your sound a bit - and this is where the FuzzMo comes in"
Rotary controls offer gain, shape, volume and blend, with an additional character micro- switch for flat, subtle or mid- scooped EQ. Shape alters the distortion wave for some significant alternatives; volume sets your effected level, and blend allows a good balance between clean and effected bass sound. This is where the fun really begins, and by running the character switch on the flat setting and gradually turning the shape control, the distortion takes on a more nasal attitude; somewhere within the sweep, you'll find exactly what you're after. From there, you can adjust the rest, and you'll experience how much control the FuzzMo is offering your distorted sound. Moving the character switch away from the flat setting smoothes the sound somewhat, but also adds a funkier element, and to enhance this feature just tweak the blend control. 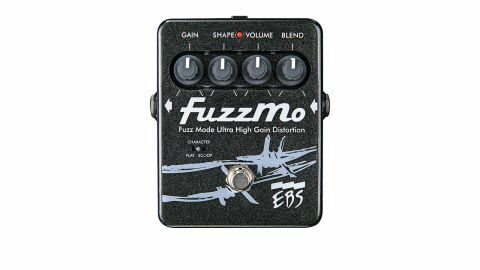 But this is the whole point of the FuzzMo: loads of distortion, but loads of control, too; and the sound remains strong and stable throughout, no matter what settings you choose. A full-on distortion booster with a great choice of fuzz tones that are consistent, and ideally suited to the bass guitar. With so much control to hand, the FuzzMo can guarantee to produce the right sound.